Description The X-Hawk is an experimental platform that uses ducted fans and fly-by-wire concepts to achieve the goal of being an easy and safe to fly aircraft in a typical urban environment. This kind of environment puts the helicopter at a disadvantage when it comes to safety issues because its rotating rotors can easily hit objects in its vicinity. The X-hawk solves this with a ducted fan design while maintaining all of the desirable VTOL capabilities. The X-Hawk technology (registered as Fancraft™) has been developed by Urban Aeronautics, an Israeli company located in Tel Aviv and owned by Rafi Yoeli. The Fancraft™ technology is based on a ducted, dual-fan configuration. Lateral thrust is generated by a patented vane control system, which is comprised of a cascade of vanes at the inlet of the duct and a cascade at the outlet. In this way, lateral motions are separated from angular motions. The rotorheads of the ducted fans do not, therefore, need cyclic control. The intellectual property of Fancraft™ is licensed to two separate legal entities: Tactical Robotics Ltd and Metro Skyways, both of which are 100% owned by Urban Aeronautics. The first company aims to use the Fancraft technology in unmanned aircrafts for military and homeland security purposes. The second firm is trying to create an air taxi marketplace, hence the name Metro Skyways. This company also focuses on search and rescue applications. At the time of writing (2014), an unmanned prototype is being tested. Urban Aeronautics expects the first commercial release to take place before 2020. The X-Hawk is an experimental platform that uses ducted fans and fly-by-wire concepts to achieve the goal of being an easy and safe to fly aircraft in a typical urban environment. This kind of environment puts the helicopter at a disadvantage when it comes to safety issues because its rotating rotors can easily hit objects in its vicinity. 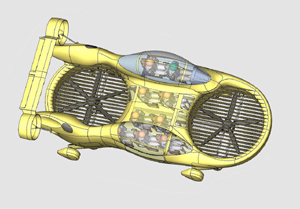 The X-hawk solves this with a ducted fan design while maintaining all of the desirable VTOL capabilities. Do you want to comment the Urban Aeronautics X-Hawk helicopter?